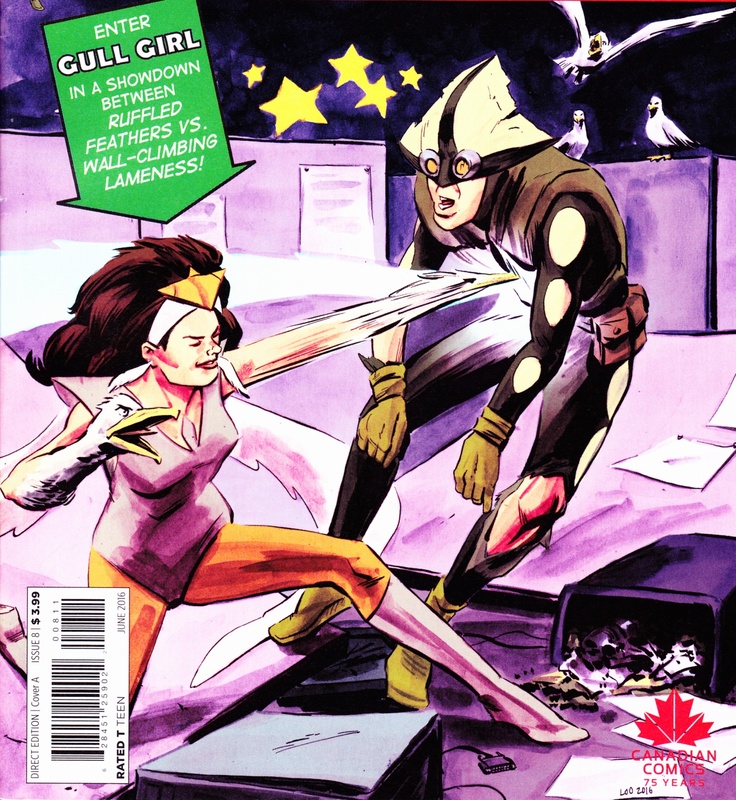 In the initial stories by Fred Kennedy and Adam Gorham, Gull Girl is an ambiguous villain and Bluenoser* is her nemesis, but she is the dominant figure in these stories. Her villainy is standing up for sea gulls and demanding respect for them. “Gull girl’s” distinguishing feature is that her arms have sea gull heads instead of hands. 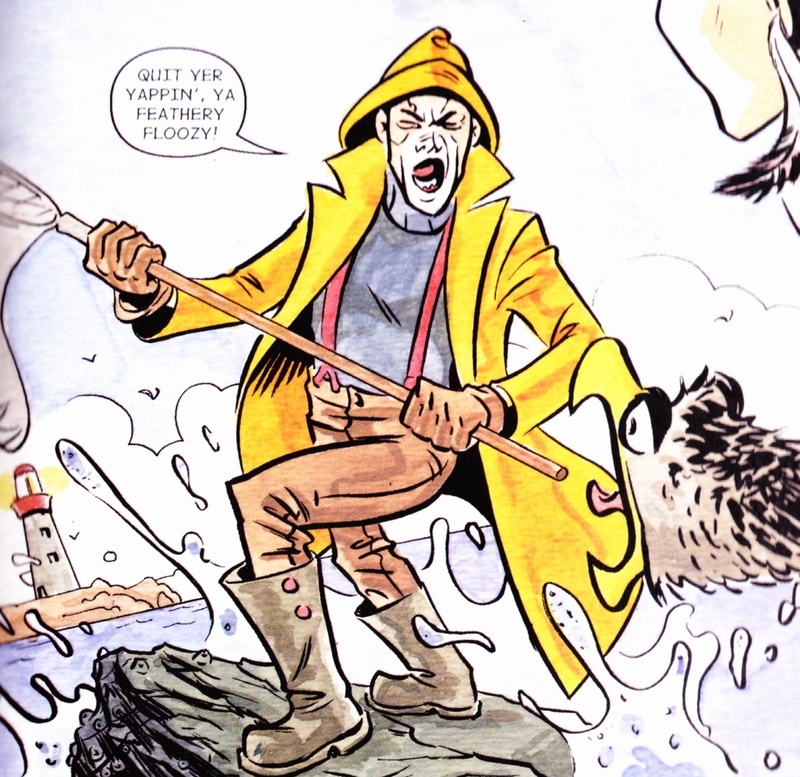 “Bluenoser’s” costume was the clothing of a typical Nova Scotian fisherman. The stories are humorous. In the first, “Gull Girl” is defeated by “Bluenoser” because her gull hands are distracted by a sandwich thrown away by a boy among the beach crowd watching the fight. The second story is apparently between “Gull Girl” and “Anne Murray”, yes that iconic singer from Springhill Nova Scotia. “Gull Girl” kidnaps Murray who is singing at the prison in which “Gull Girl” is incarcerated (apparently for her disturbance on the beach), in order to escape. During this escape we find that “Gull Girl” once thought of calling herself “Snowbird”. She then proceeds to list more of the virtues of seagulls. In the last panels it turns out Anne Murray is actually “Bluenoser” in disguise and “Gull Girl” is thwarted in her escape. 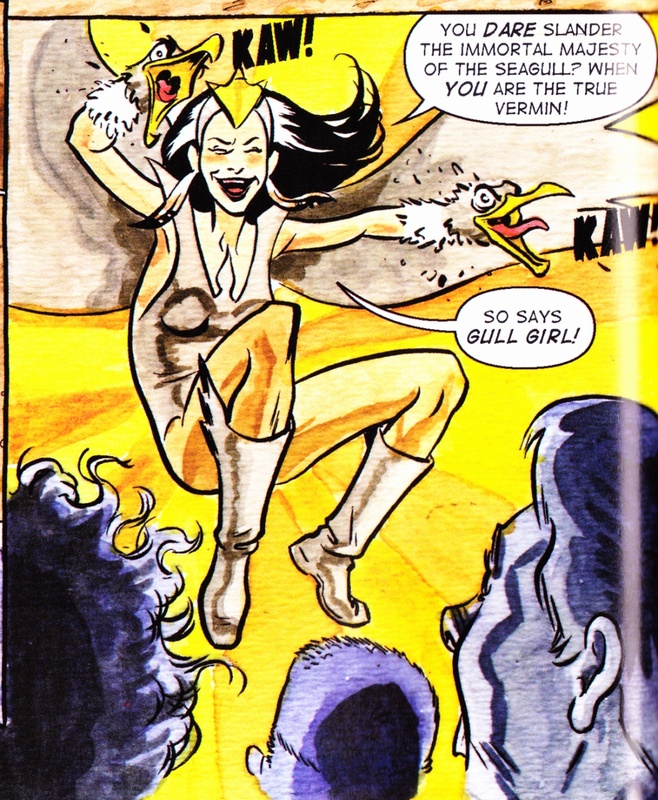 Although “Gull Girl” was still written by Fred Kennedy, Jason Loo took over illustration duties for her guest appearance in Pitiful Human Lizard, and Rob Armstong did the same for her appearance in the periodical True Patriot Presents. In Pitiful Human Lizard, the Nova Scotian elements and “Bluenoser” disappear. “Gull Girl” takes on more superhero elements, sprouts a pair of wings and becomes more distinctly villanous. “Pitiful Human Lizard” becomes the chief adversary, and a fantasy element is introduced. The story arch also loses its lighthearted whimsy and takes on the more serious the world is in peril tone. In the final version “Hail To The Gull” which is a kind of origin story and synopsis, the fantasy element is completed. “Gull Girl” has been transformed into a misunderstood world savior and “Bluenoser” returns as a reactionary opposition. The story now takes itself very seriously and has become full of message. *Bluenoser” was originally a nickname for Nova Scotian fishermen but is now used for all Nova Scotians. The most famous “Bluenose” is the unbeatable sailing ship captained by Angus Walters. “Bluenoser vs. Gullgirl.” Writ., Fred Kennedy. Illus., Adam Gorham. Col., Brian Envou. True Patriot: All New Canadian Comic Book Adventures. Ed., J. Torres. True Patriot Comics, 2013: 42-44. “Gull Girl vs. Anne Murray.” Writ., Fred Kennedy. Illus., Adam Gorham. Col., Brian Envou. True Patriot: Heroes Of The Great White North. Ed., J. Torres. True Patriot Comics, 2014: 53-60. Front. Illus., Jason Loo. Pitiful Human-Lizard, 8, Apr. 2016. “The Gull Croaks Before Lunch Break.” Writ., Fred Kennedy. Illus., Jason Loo. Pitiful Human-Lizard, 8, Apr. 2016. “Gull Girl: Hail To The Gull.” Writ., Fred Kennedy. Illus., Rob Armstrong. Col., Sigmund Torre. True Patriot Presents, 1, Nov. 2016. From “ Bluenoser vs. Gull Girl.” Illus., Alex Gorham. True Patriot All New CanadianComic Book Adventures, 2013: 42. From “ Bluenoser vs. Gull Girl.” Illus., Alex Gorham. True Patriot All New CanadianComic Book Adventures, 2013: 43. Illus., Jason Loo. From the front cover of The Pitiful Human Lizard, 8, June 2016. “Hail To The Gull.” Illus., Rob Armstrong. True Patriot Presents, 1, Nov. 2016.